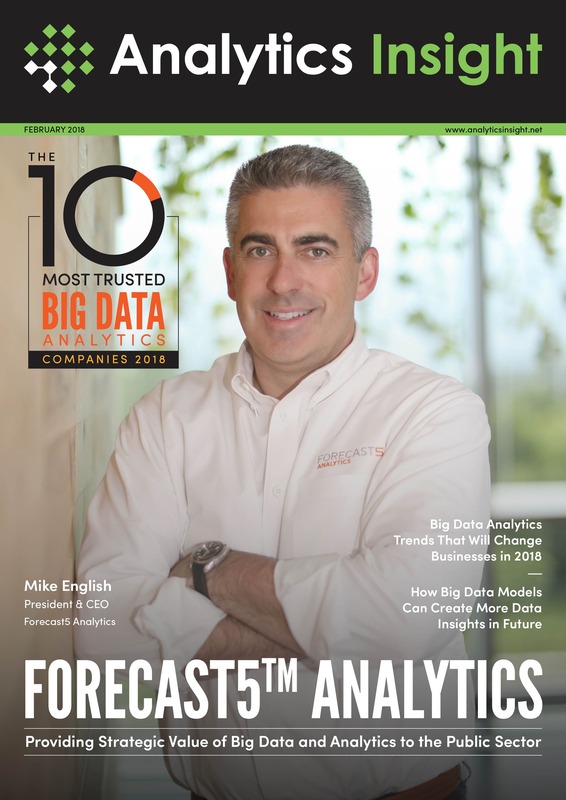 Forecast5 announced today that is has been named one of "The Most Trusted Big Data Analytics Companies of 2018" by Analytics Insight in its February magazine issue. Naperville, IL (February 12, 2018) - Analytics Insight, a brand of Stravium, features Forecast5™ Analytics, Inc. as the Cover Story in its February magazine issue, "The Most Trusted Big Data Analytics Companies of 2018". Forecast5™ Analytics is significantly helping public sector organizations to improve existing processes, bring transparency, drive strategic planning and make a powerful impact on our society. Big data and analytics have become key competitive differentiators and top investment priority among organizations globally. Organizations using big data and analytics tools and platforms enjoy increased agility, better integration with partners, and boost overall performance and profitability. The featured companies are on the cutting edge and are transforming the way businesses are carried out by offering state-of-the-art big data and analytics solutions. The insights offered by the companies empower organizations to keep pace with their peers in this highly competitive data-driven industry. "We extend our sincere congratulations to all the 10 companies for delivering excellent services and experiences to their customers," says Ashish Sukhadeve, Founder & Editor-in-Chief at Analytics Insight.